Burke, Christopher & Robert J. Garitta. GURPS Autoduel (2nd ed. ), Steve Jackson Games. Explorable Wyoming; poker tournament set up to shift into autoduels. Dedman, Stephen. Badlands in Pyramid Online. Entire Comanche-Salvation-Rosary story arc; Lupita. Dupuis, Ann, et al. 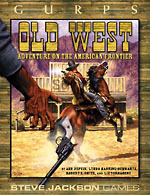 GURPS Old West, Steve Jackson Games. General background; Johnny's Indian background. Hackard, Andrew & Stephen Dedman. GURPS Deadlands, Steve Jackson Games. Shiftworld soundtrack Vol. 1. Track 12: Dark Night, The Blasters. Tombstone. Directed by George P. Cosmatos. Shiftworld and all materials pertaining TM Michel M. Albert. GURPS TM Steve Jackson Games.